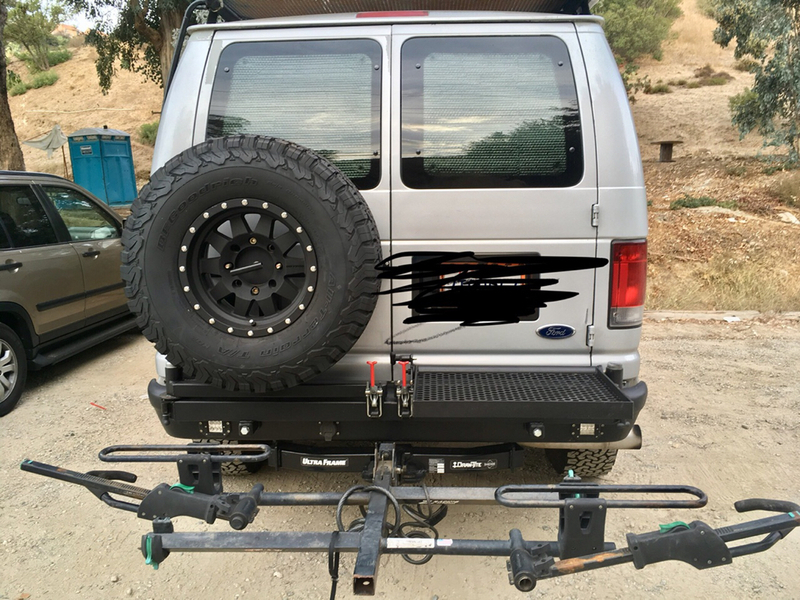 Spotted this van at a local trailhead and really liked the rear bumper. 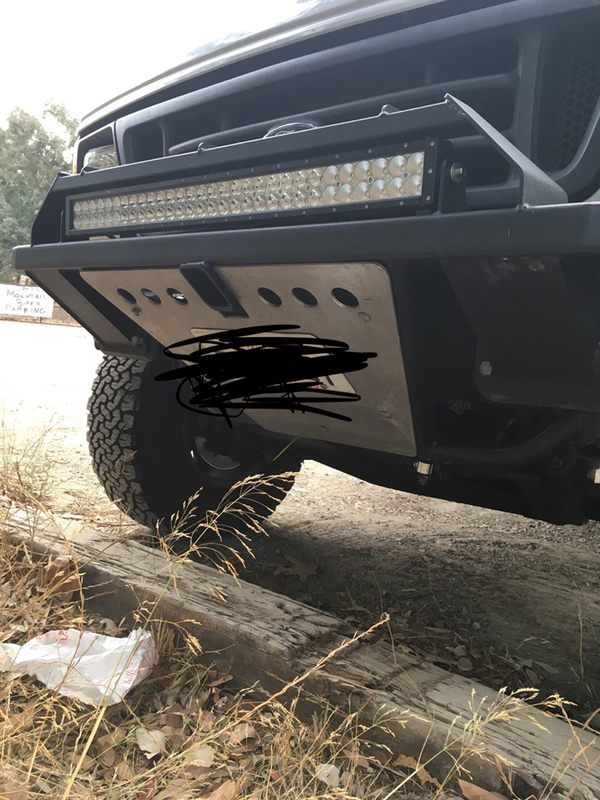 That’s a stock, non step bumper with ports welded into it for the swing outs. The front bumper had a nice look to it as well. That is slick. Wonder if it’s tied into the hitch or frame. Just from a guess on the locations of the supports it looks like they go directly to the mounting flanges on the frame. Could be dead center. Which would be a very trick way to mount the whole deal. Very well thought out design and dang, the more I look at it the more well thought out it becomes. Upside down pop pins, the spindle pivots go back up and over the stock bumper, and I bet if you remove those two bolts you can slide the whole pivot and arm assembly off. Hey Brian, if you see that one again, crawl up under there and see how that mounts to the frame flanges!! Nobody will think you strange for crawling around under a van at a trailhead. Haha, funny you say that Flux.....! I think the owner of that van lives on the same street here in Orange that I lived on until a few months ago. 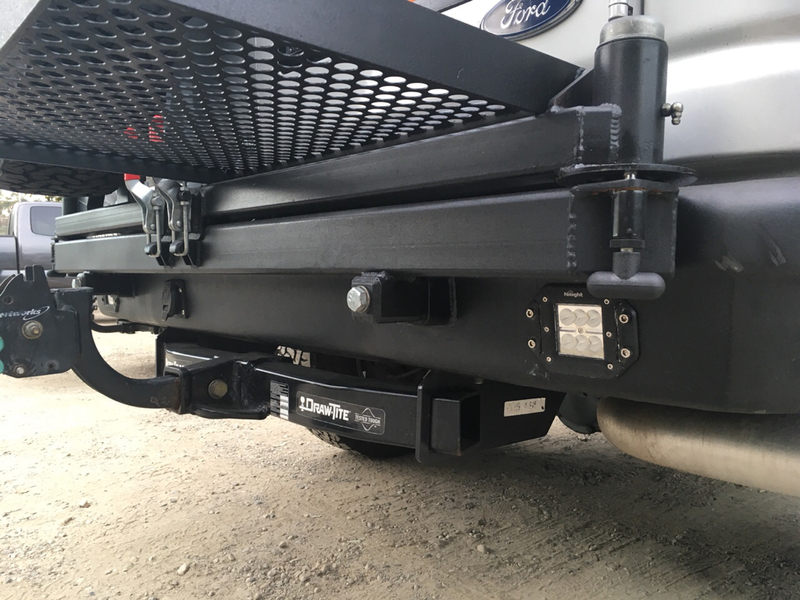 When he first got that van (last Spring, I believe), I noticed that it had the Action Van 2WD lift kit in it......the same suspension lift kit that I was still looking into getting for my own van. So of course I immediately pulled over and started ogling his rig. I had to be seriously disciplined with myself....to NOT crawl under it, which I badly wanted to do.......but I definitely DID squat and peer in his fender-openings and under the front/rear bumpers.....though I made sure to stay at least a good 5-6 feet away from the van, JUST to make sure I was far enough away to not appear to be messing with his rig. Despite that, after about 3 minutes of me doing my best to appear harmless while simultaneously staring at his rig....his wife opened the door of their house and called out (very pleasantly, I must say) "Heyyyyyy.....can we help you?" Hehe, when she found out I lived right down the street and was another "van person," she was instantly super cool. She laughed about how people are frequently asking them questions about the van. I've still yet to catch up with that guy and check his rig out with him, but I see him cruising it quite often in the Orange area. Really get the sense he might be doing quite a bit of that trick custom work himself. Very tasteful and cleanly-constructed stuff! Flux, weren't you contemplating using this sort of setup in a design? The de staco clamps latching the swingarms are cool and readily available. Thank you sharing those pictures, that's really helpful for me right now. I've been pondering building something similar, but on the other side of the rear bumper. Basically sandwich a bar like that between the van and the stock bumper. 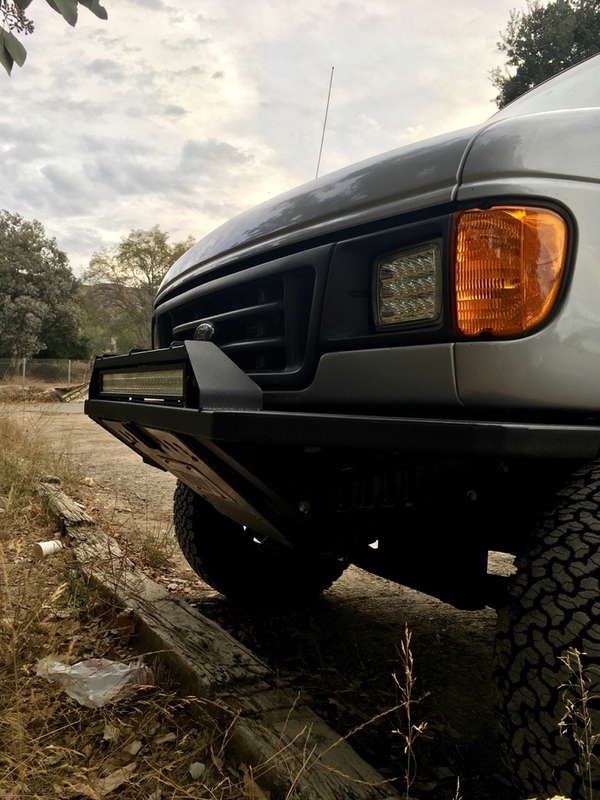 This would involve some trimming to the top of the stock bumper. I had a couple different thoughts on the rear swingout design. I eventually went with a steel frame, super burly spindles, and an aluminum shell that will fit over it. I have the steel frame done, just need to get motivated. I really do like this design though, very very clever. The front bumper is really cool as well, I like the bent metal and tubing. You can get the pop pins on Mcmaster, the latches too, but maybe not those exact ones.